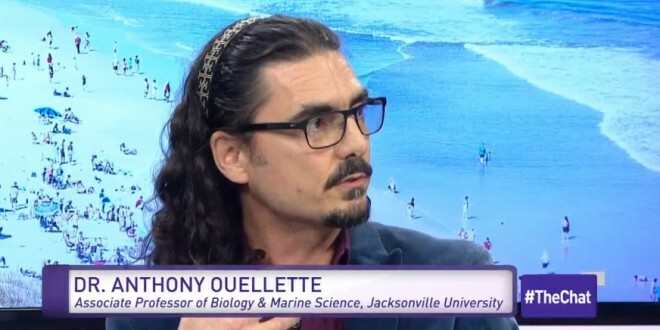 Dr. Andy Ouellette, JU Associate Professor of Biology & Marine Science who recently appeared on First Coast News’ “The Chat” to talk about Flesh-Eating Bacteria, is set to appear on the TV show again, on Wednesday, July 29, this time to talk about “Crypto”. Cryptosporidium is a microscopic parasite that causes the diarrheal disease cryptosporidiosis. It is commonly spread through drinking water and recreational water, and is a leading cause of waterborne disease among humans in the United States, according to the Centers for Disease Control and Prevention. Below, you can catch Dr. Ouellette on “The Chat” as he discussed Necrotizing Fasciitis (Flesh-Eating Bacteria), the pathogenic Vibrio vulnificus and how to look for signs and avoid these dangerous organisms. Dr. Ouellette was on the show to break down the facts and dispel the myths.